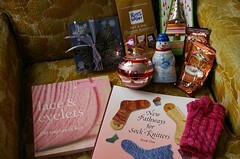 Last Friday I received my Special Swap package from Beth of Felt Like Knitting. She was hoping I would get it before Christmas and she definitely came through! 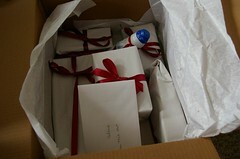 First there were chocolates, hot chocolate mixes, a Lindt chocolate snowman and Christmas tea. Then I found snowflake shaped cookie cutter and a beautiful pink, red and silver ornament. 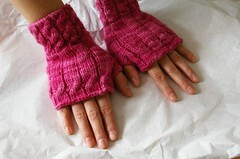 Then I found a beautiful pair of Fetchings knit in Rio de la Plata yarn in Carnation Pink. 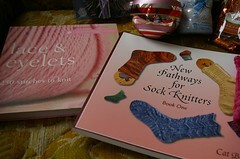 Last but not least were these two books, one of which I’d be dying to get since September. I think you can guess which one it is… I can’t wait to try out these new sock architectures! Thank you Beth for such a wonderful swap! I do hope you get your package before New Year’s!